Nigerian cake is simple and sweet. There's not a lot going on in the cake but it tastes delicious. No chocolates, no whipped cream but Nigerians love it and they are always searching for that unadulterated Nigerian Cake recipe for that cake that melts in the mouth. The quantities of ingredients listed below are what I used for a cake that I baked with a 10 inch diameter and 2.5 inch deep cake pan. When done, the cake had a diameter of 10 inches (of course) and a height of 2.5 inches with a slight dome. Cake Pan: 10 inches in diameter and 2.5 inches deep. 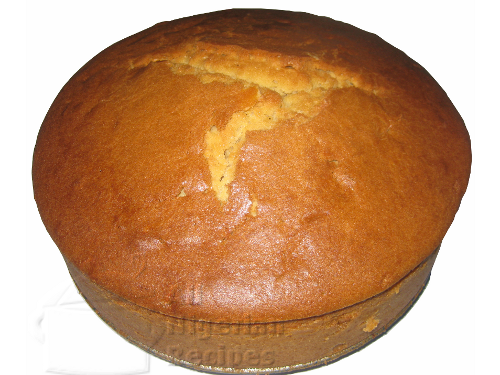 You MUST use plain flour for you to have success with the Nigerian Cake recipe detailed on this page. I do not know what using a self-rising flour will do to your cake if you use it. The problem with self-rising flour is that they never state the amount of the leavening agent (in this case, baking powder) they added to the flour. This is why I prefer plain flour so that I have more control over the amount of baking powder that I add to the cake recipe. For those living in Nigeria, please use baking butter NOT margarine. You should be able to buy baking butter from any shop that sells bakery ingredients. For my US audience whose butter comes in sticks. I don't know the weight of 1 stick of butter. Maybe this is written on the wrapping so you can check it and then know how many sticks correspond to 1.1 lbs. Please do not melt the butter. Bring it out from the fridge the day before you make your Nigerian cake. This way, it will be soft enough for creaming on the day you'll bake the cake. 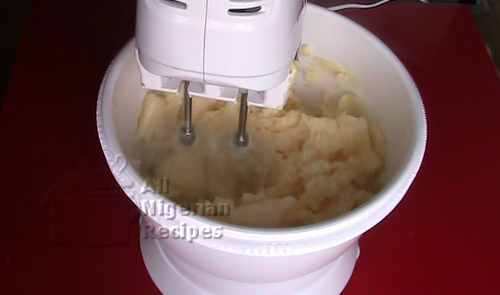 If you think your granulated sugar is too coarse, you can grind it with a dry mill (the one used for grinding egusi, ogbono, etc) before adding it to the butter for creaming. You only need to grind it a little bit to reduce the size of the grains of sugar. This reduces the creaming time. The job of the vanilla extract is just to add a vanilla flavour to the cake. If you want another flavour such as butterscotch (used in wedding cakes) etc, please use it to replace the vanilla flavour and add it when I add the vanilla flavour. If you want to add dry fruits such as raisins, please soak these in brandy for at least 1 week (up to 1 month for Nigerian wedding cakes) before adding it to your cake. This is so that the fruits will not make the cake go bad or taste funny after some time especially for Nigerian Wedding cakes which people like to keep for a longer time. The brandy is a preservative for the cake. With all those eggs in the cake, it can go bad before the event if you don't add brandy or any other cake preservative to it. Here, I am talking about if you will place the cake on the counter for a few days while decorating it (especially for wedding cakes). But if you are making a cake that you will throw into your freezer as soon as it has cooled down, then no need for the brandy. But please do not go overboard with the brandy. You don't want people to feel tipsy after eating your cake. Make sure that all the utensils and appliances you will use for the cake are clean and dry. Check, check and check that you have all the ingredients you will need to bake the cake. 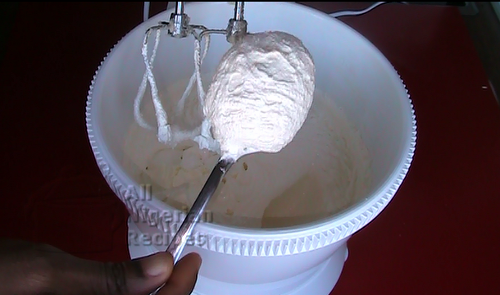 Put the soft butter and the granulated sugar into the mixer and start creaming. I used the highest setting on my mixer which is a 300 Watts appliance and the creaming took me a total of 1 hour. Please follow the instructions in the user manual of your mixer when creaming. For my mixer, the instruction says that I should not run the appliance for more than 10 minutes at a time. So, I cream for 10 minutes, stop to let the mixer rest and cool down, I run it again for ten minutes etc. And it took me a total of 1 hour creaming time (stoppage time NOT included) to completely cream the butter and the sugar. Your own time may be more or less depending on the type of mixer you have and the size of the grains of your sugar. 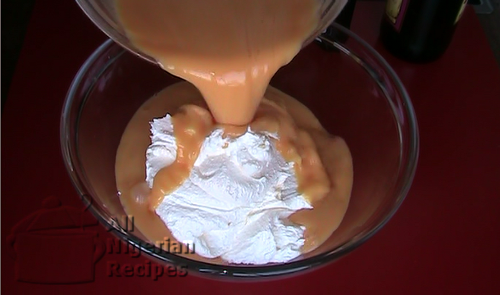 A well-creamed sugar/butter mix should look much whiter than the butter you started with, softer (it should be able to drop from a spoon, see video) and you can barely feel the granulated sugar when you taste the creamed butter and sugar. Some granulated sugar may be stubborn and you can still feel the grains but it's OK so long as the butter/sugar mixture is as white and soft as possible. When you are almost done with the creaming, prepare your cake pan by rubbing the insides with soft butter. Then put some flour into the greased pan, making sure the flour touches every part, then pour out the flour. 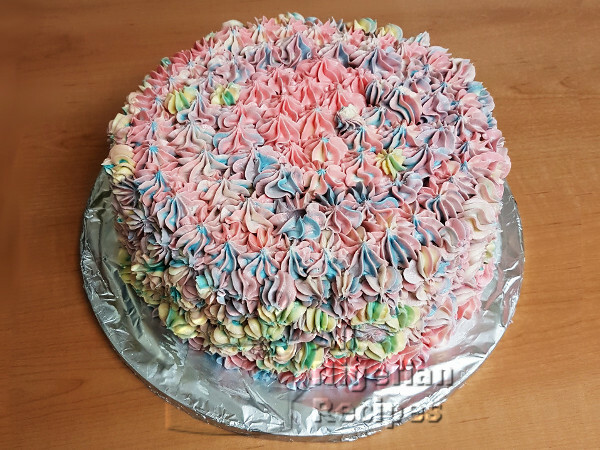 The greasing and flouring of the insides of your cake pan will prevent the cake from sticking to the pan thereby making it easy for you to bring out the cake from the pan when done, without denting the cake. Break all the eggs into a big bowl and whisk them to a smooth blend. Before you do this step, you should make sure that your butter and sugar are well creamed. If your mixer is big enough to accommodate the creamed butter and sugar with the whisked eggs, add the whisked egg into the mixer. Mix till you have a smooth fluffy blend of the creamed butter/sugar and the eggs. 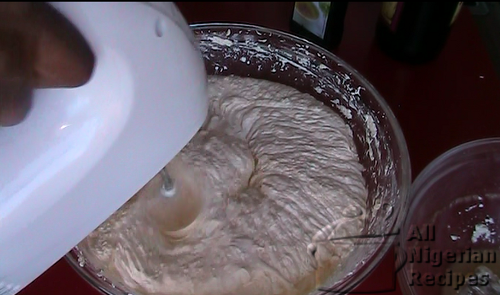 If your mixer is not big enough, transfer the creamed butter and sugar to a bigger bowl. Add the eggs and use a hand mixer to mix the two till you get a fluffy smooth blend. My mixer is quite small so this is what I did in the video below. This took me about 5 minutes with my 300 Watts hand mixer which is extractable from my mixer. It's now time to turn on your oven to 150°C or 302°F so that it can start heating up while you finish mixing the cake. You should also switch it to the up & down heat setting. Add the vanilla extract or any other flavours of your choice, add the brandy and pre-soaked dry fruits (if any) and stir with a wooden spatula till everything is well incorporated. 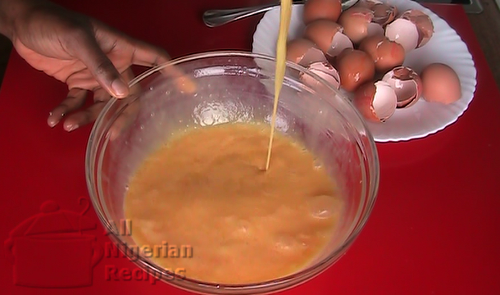 Add some browning if you are baking a Nigerian wedding cake. This is what gives the cake the dark colour. Now, add the baking powder to the plain flour. Put the mix into a sieve or a flour sifter. 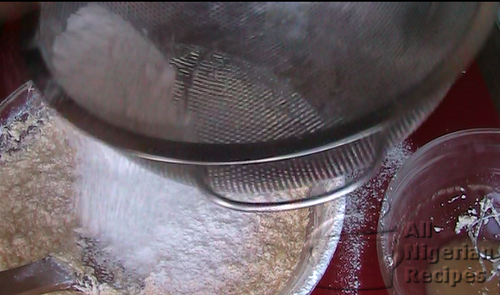 Add small quantities of the flour through the sieve/sifter into the bowl where you already have other cake ingredients. Stir very well with the wooden spatula. Add another small quantity of the flour with baking powder. Stir. It is advisable to stir the cake mix in one direction, in a folding fashion, when adding the flour because most cake experts say that when you stir in the opposite direction, air bubbles will be trapped in your cake mix and your cake will have holes in it when done. It is important to pass the flour through a sieve or sifter so that you are sure that the flour that enters the cake mix in its finest powder form. You don't want to have small lumps of flour in your cake do you? This also ensures a very smooth cake mix. Once every ingredient is well incorporated, it's time to pour the mix into the greased cake pan. If you want to make a multicolour layered cake then you should at this point divide the cake mix into the number of colours you want. Put these into separate clean dry bowls. Add the colours to each, stir well and pour into the cake pan one after the other. You should make sure you level out each coloured cake mix as much as possible before pouring another one. Once you've poured in all the cake mix into the cake pan, gently lift and drop the cake pan several times to level out the cake mix as much as possible (see video). Don't worry if the top is not so smooth, as soon as the heat of the oven gets to it, it will level out. Transfer the cake to the preheated oven, placing the rack halfway between the top and the bottom of the oven. Even though mine took 2 hours, you should keep an eye on yours till you notice that it is no longer rising before attempting to open the oven door. All ovens are not the same so you should use my baking time as a guide only. After 2 hours, when I'm sure that the cake is no longer rising, I check it by driving a knife into the center of the cake. If the knife comes out with smears of the cake mix, then the cake is not done. If it comes out clean and dry, with only a smear of butter (oily look) then the cake is done. If the cake passes the knife test, I go on to do the other tests. The second way I check the cake is to take a look at the sides of the cake pan. The cake should be separated from the pan or at least not stuck to the pan. The third way I check that the cake is done is to dip a wooden skewer (stick) into the middle of the cake. Wooden skewers are a bit rougher than knives so they tend to pick up smears more. So if the wooden skewer comes out clean, the cake should be done. Even when my cake passes all of the above checks, I still carry out the fourth test so that I can be doubly sure that it is done before bringing it out of the oven. Nobody wants to end up with an undone cake. The fourth and final check I carry out is to gently push the cake down at the middle with my open palm. If the cake springs back when I lift my palm and there is no impression of my palm on the cake, then the cake is done. Once you are sure that the cake is done, bring it out of the oven and leave it alone for only 5 minutes then take out the sides of the pan. Then leave to cool down completely before decorating the cake. You can also cut it up in desirable sizes and store in the freezer. 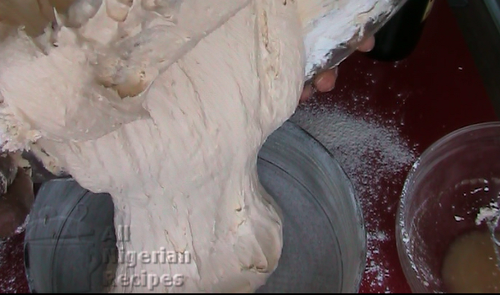 That's how the Nigerian Cake is made. You can serve it up as a snack with a chilled drink or eat it as a dessert. When decorated, use for birthdays and weddings. This Nigerian Cake Recipe is originally published at www.allnigerianrecipes.com. 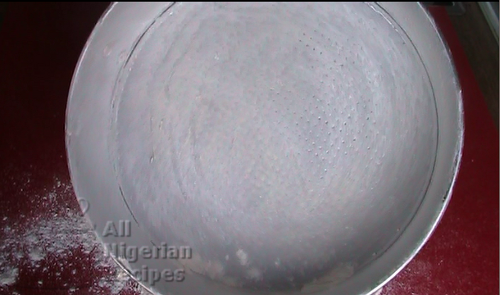 The recipe details how to make Nigerian Cake.